The NYC Ferry system has announced two expanded routes which will now include the Lower East Side, Manhattan, and The Bronx. 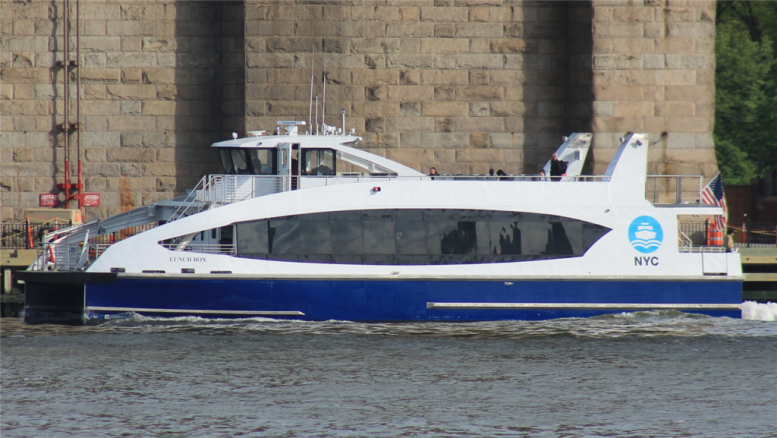 The expanded service arrives as a joint initiative with The New York City Economic Development Corporation (NYCEDC) and Hornblower, a private cruise and charter company that operates NYC’s ferry network. 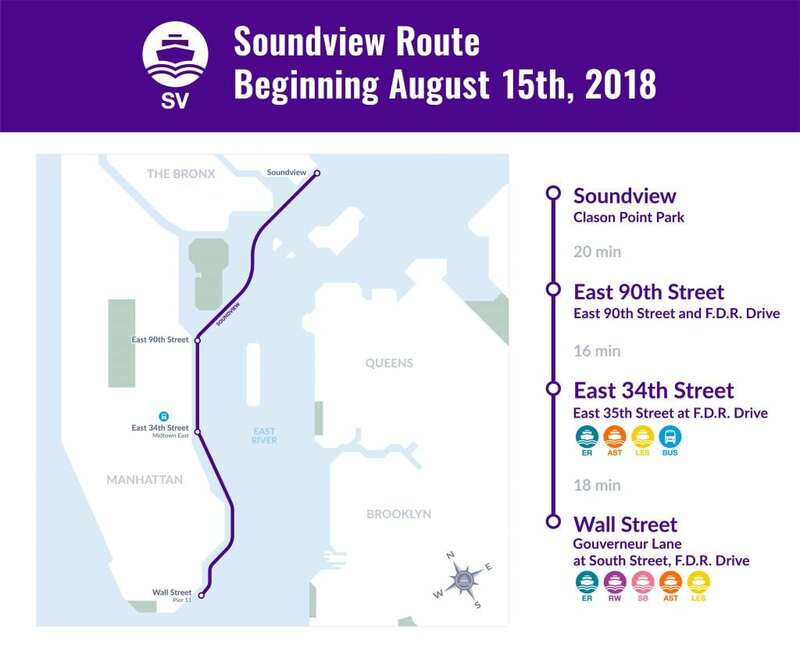 The Soundview route begins on August 15th and will ferry passengers from Clason Point Park in The Bronx to Wall Street/Pier 11. Stops will include East 90th Street on the Upper East Side and East 34th Street. 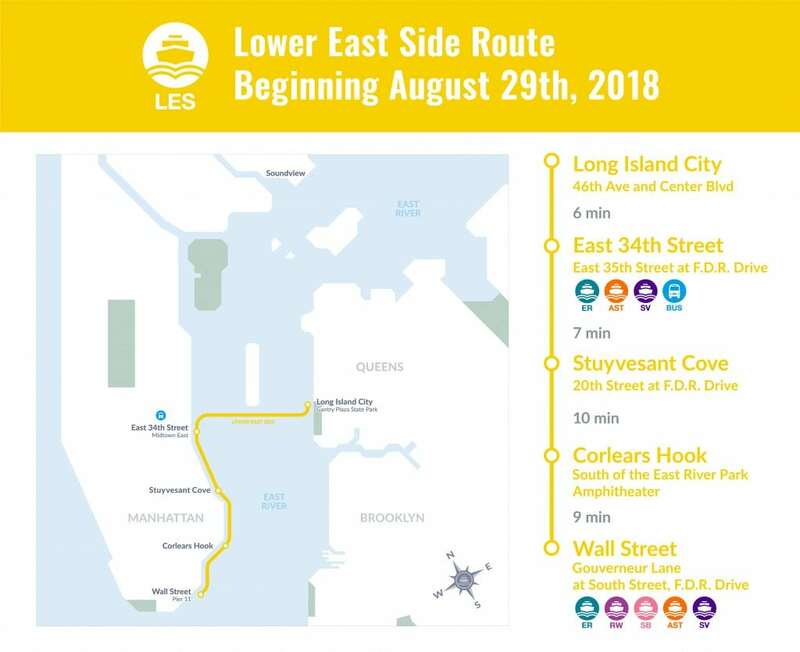 The Lower East Side route will begin from Wall Street/Pier 11, stopping at Corlears Hook, Stuyvesant Cove, and East 34th Street, with Long Island City, Queens as the final port. From start to finish, the trip is estimated at about 32 minutes. Service will begin on August 29th. Launched in 2017, annual ferry ridership has ballooned to over 4.5 million passengers. New York City Mayor Bill de Blasio has since commissioned new vessels to expand the existing fleet’s capacity in response to higher-than-expected ridership. 23 Comments on "NYC Ferry Routes Expand Service Across Manhattan and The Bronx"
Please pardon me for using your space: Where you can use service, spending time on the water I think it’s good. Let’s stop calling it the NYC Ferry. It is the Four Borough Ferry. When they decide to provide service to FIVE HUNDRED THOUSAND people living on Staten Island, then they can call themselves the NYC Ferry. Does this piss me off? Absolutely. It is simply pathetic that this service is now 14 months old, and there isn’t even a plan for a route that includes Staten Island. Staten Island is much further away from these commuter piers than they are from each other and there is already a *free* ferry from Staten Island to Manhattan. Why would they expand their service there? Because 1) The free ferry takes 25 minutes to five miles. If there were a fast ferry from St. George to Whitehall it could cut that time by more than half. 2) The prime route for a fast ferry are from the south/east shore to Wall St. or Battery Park City- it would cut the commute from those places by about an hour each way. 3) Another route would be from St. George to West 34th St. That would be about 30 minutes less than it takes now. I think much of the other four boroughs needs to learn a lot more about this island. Staten Island might be small in population compared to the other four boroughs, but if it were a city unto itself, it is almost 200,000 people larger than Buffalo. It would be the 36th largest city in the nation. In would be the largest city in 28 of the 50 states. If you lived here, you’d understand very quickly why transportation is such a big issue here. Staten Island is pretty dense. About the same as Washington DC. The real issue is the location of the population in regards to possible pier locations. Also, the city has been studying the feasibility of an NYC ferry stop on SI. Locations on Staten Island were studied for the implementation of NYC ferry but were not selected either due to more limited ridership projections or the feasibility of pier construction. These two new routes were prioritized according to certain standards established by the city. The ferry will continue to expand though and SI will eventually get a route in the future. Maybe Something between SI and north Brooklyn. Staten Island needs to increase its walkability, transit utilization and density before it is served by more transit. It needs to embrace urbanism if it is going to have the same services as other boroughs. This is unlikely – there is a heavy suburban mindset in SI. Staten Island is dense enough, the problem is really land-use patterns. The older, more built up neighborhoods in the north have a distinct advantage. SI will get a NYC ferry route in the future though. You can increase the density here, with the exception of the extreme north shore (St. George) without address transportation first. It isn’t just getting to and from the other boroughs, our local streets are choked with traffic too. Want to increase the density- extend the 1 train from Whitehall across the harbor to St. George and then all the way down Victory Blvd and then south along Richmond Avenue. Add those 16 miles of subway, and you’ll have a corridor that can support a higher density of people. Have $30 billion? StatenIsland 1967: Would you be satisfied if the city renamed the current Staten Island Ferry as a NYC Ferry, and began charging $2.75 per ride, as all other NYC Ferries charge? Haven’t the Republicans on Staten Island succeeded from the city yet? You shouldn’t pay taxes on that socialist ferry anyway. The new ferry routes are a game changer. Maybe the best thing to happen in NYC in the past couple of years. I would like to see the Soundview route extended to Throgs Neck and City Island. I also don’t understand what’s the point of terminating lines in Manhattan. You could probably combine the Soundview and Rockaway lines to create one long distance route. Maybe they keep the routes short so I— er, I mean other people —don’t joyride the ferries all day? I’m not used to the Bronx being thought of so much. Oh wait! Gentrification, that’s right! Gentrification, good. Staten Island, bad.